What is Tesla coil ? A Tesla coil is a type of Resonant_transformer circuit invented by Nikola Tesla. It is used to produce high voltage, relatively high current and high frequency alternating current electricity. The early Tesla coil transformer design employs a medium- to high-voltage power source, one or more high voltage capacitor(s), and a spark gap to excite a multiple-layer primary inductor with periodic bursts of high frequency current. The multiple-layer Tesla coil transformer secondary is excited by resonant inductive coupling, the primary and secondary circuits both being tuned so they resonate at the same frequency (typically, between 25 kHz and 2 MHz). The later and higher-power coil design has a single-layer primary and secondary. These Tesla coils are often used by hobbyists and at venues such as science museums to produce long sparks. Tesla coil circuits were used commercially in sparkgap radio transmitters for wireless telegraphy until the 1920s, and in electrotherapy and pseudomedical devices such as violet ray (although Tesla circuits were not the first or the only ones used in spark transmitters). Today their main use is entertainment and educational displays. Tesla coils are built by many high-voltage enthusiasts, research institutions, science museums and independent experimenters. Although electronic circuit controllers have been developed, Tesla's original spark gap design is less expensive and has proven extremely reliable. A Tesla coil transformer operates in a significantly different fashion than a conventional (i.e., iron core) transformer. In a conventional transformer, the windings are very tightly coupled, and voltage gain is limited to the ratio of the numbers of turns in the windings. However, unlike a conventional transformer, which may couple 97%+ of the magnetic fields between windings, a Tesla coil's windings are "loosely" coupled, with the primary and secondary typically sharing only 10–20% of their respective magnetic fields and instead the coil transfers energy (via loose coupling) from one oscillating resonant circuit (the primary) to the other (the secondary) over a number of RF cycles. As the primary energy transfers to the secondary, the secondary's output voltage increases until all of the available primary energy has been transferred to the secondary (less losses). Even with significant spark gap losses, a well designed Tesla coil can transfer over 85% of the energy initially stored in the primary capacitor to the secondary circuit. Thus the voltage gain of a Tesla coil can be significantly greater than a conventional transformer, since it is instead proportional to the square root of the ratio of secondary and primary inductances. In addition, because of the large gap between the primary and secondary that loose coupling makes possible, the insulation between the two is far less likely to break down, and this permits coils to run extremely high voltages without damage. Modern high voltage enthusiasts usually build Tesla coils that are similar to some of Tesla's "later" air core designs. These typically consist of a primary tank circuit, a series LC (inductance-capacitance) circuit composed of a high voltage capacitor, spark gap and primary coil, and the secondary LC circuit, a series resonant circuit consisting of the secondary coil plus a terminal capacitance or "top load." In Tesla's more advanced design, the secondary LC circuit is composed of an air-core transformer secondary coil placed in series with a helical resonator. The helical coil is then connected to the terminal capacitance. Most modern coils use only a single helical coil comprising both the secondary and primary resonator. The terminal capacitance actually forms one 'plate' of a capacitor, the other 'plate' being the Earth (or "ground"). The primary LC circuit is tuned so that it resonates at the same frequency as the secondary LC circuit. The primary and secondary coils are magnetically coupled, creating a dual-tuned resonant air-core transformer. Earlier oil insulated Tesla coils needed large and long insulators at their high-voltage terminals to prevent discharge in air. Later version Tesla coils spread their electric fields over large distances to prevent high electrical stresses in the first place, thereby allowing operation in free air. Tesla's 1902 design for his advanced magnifying transmitter used a top terminal consisting of a metal frame in the shape of a toroid, covered with hemispherical plates (constituting a very large conducting surface). The top terminal has relatively small capacitance, charged to as high a voltage as practicable. The outer surface of the elevated conductor is where the electrical charge chiefly accumulates. It has a large radius of curvature, or is composed of separate elements which, irrespective of their own radii of curvature, are arranged close to each other so that the outside ideal surface enveloping them has a large radius. This design allowed the terminal to support very high voltages without generating corona or sparks. Tesla, during his patent application process, described a variety of resonator terminals at the top of this later coil. Most Modern Tesla coils use simple toroids, typically fabricated from spun metal or flexible aluminum ducting, to control the high electrical field near the top of the secondary and to direct spark outward and away from the primary and secondary windings. As pointed out above, more advanced Tesla coil transmitters involve a more tightly coupled air core resonance transformer network or "master oscillator" the output of which is then fed another resonator, sometimes called the "extra coil." The principle is that energy accumulates in the extra coil and the role of transformer secondary is played by the separate master oscillator secondary; the roles are not shared by a single secondary. In some modern three-coil Magnifying transmitter systems the extra coil is placed some distance from the transformer. Direct magnetic coupling to the upper secondary is not desirable, since the third coil is designed to be driven by injecting RF current directly into the bottom end. This particular Tesla coil configuration consists of a secondary coil in close inductive relation with a primary, and one end of which is connected to a ground-plate, while its other end is led through a separate self-induction coil (whose connection should always be made at, or near, the geometrical center of that coil's circular aspect, in order to secure a symmetrical distribution of the current), and of a metallic cylinder carrying the current to the terminal. The primary coil may be excited by any desired source of high frequency current. The important requirement is that the primary and secondary sides must be tuned to the same resonant frequency to allow efficient transfer of energy between the primary and secondary resonant circuits. The conductor of the shaft to the terminal (topload) is in the form of a cylinder with smooth surface of a radius much larger than that of the spherical metal plates, and widens out at the bottom into a hood (which is slotted to avoid loss by eddy currents). The secondary coil is wound on a drum of insulating material, with its turns close together. When the effect of the small radius of curvature of the wire itself is overcome, the lower secondary coil behaves as a conductor of large radius of curvature, corresponding to that of the drum. The top of the extra coil may be extended up to the terminal U.S. Patent 1,119,732 and the bottom should be somewhat below the uppermost turn of the primary coil. This lessens the tendency of the charge to break out from the wire connecting both and to pass along the support. Demonstration of the Nevada Lightning Laboratory 1:12 scale prototype twin Tesla Coil at Maker Faire 2008. Modern day transistor or vacuum tube Tesla coils do not use a primary spark gap. Instead, the transistor(s) or vacuum tube(s) provide the switching or amplifying function necessary to generate RF power for the primary circuit. Solid-state Tesla coils use the lowest primary operating voltage, typically between 155 to 800 volts, and drive the primary winding using either a single, half-bridge, or full-bridge arrangement of bipolar transistors, MOSFETs or IGBTs to switch the primary current. Vacuum tube coils typically operate with plate voltages between 1500 and 6000 volts, while most spark gap coils operate with primary voltages of 6,000 to 25,000 volts. The primary winding of a traditional transistor Tesla coil is wound around only the bottom portion of the secondary (sometimes called the resonator). This helps to illustrate operation of the secondary as a pumped resonator. The primary induces alternating voltage into the bottommost portion of the secondary, providing regular "pushes" (similar to provided properly timed pushes to a playground swing). Additional energy is transferred from the primary to the secondary inductance and topload capacitance during each "push", and secondary output voltage builds (called ring-up). An electronic feedback circuit is usually used to adaptively synchronize the primary oscillator to the growing resonance in the secondary, and this is the only tuning consideration beyond the initial choice of a reasonable topload. In a dual resonant solid-state Tesla coil (DRSSTC), the electronic switching of the solid-state Tesla coil is combined with the resonant primary circuit of a spark-gap Tesla coil. The resonant primary circuit is formed by connecting a capacitor in series with the primary winding of the coil, so that the combination forms a series tank circuit with a resonant frequency near that of the secondary circuit. Because of the additional resonant circuit, one manual and one adaptive tuning adjustment are necessary. Also, an interrupter is usually used to reduce the duty cycle of the switching bridge, in order to improve peak power capabilities; similarly, IGBTs are more popular in this application than bipolar transistors or MOSFETs, due to their superior power handling characteristics. Performance of a DRSSTC can be comparable to a medium power spark gap Tesla coil, and efficiency (as measured by spark length versus input power) can be significantly greater than a spark gap Tesla coil operating at the same input power. A large Tesla coil of more modern design often operates at very high peak power levels, up to many megawatts (millions of watts). It should therefore be adjusted and operated carefully, not only for efficiency and economy, but also for safety. If, due to improper tuning, the maximum voltage point occurs below the terminal, along the secondary coil, a discharge (spark) may break out and damage or destroy the coil wire, supports, or nearby objects. Tesla experimented with these, and many other, circuit configurations (see right). The Tesla coil primary winding, spark gap and tank capacitor are connected in series. In each circuit, the AC supply transformer charges the tank capacitor until its voltage is sufficient to break down the spark gap. The gap suddenly fires, allowing the charged tank capacitor to discharge into the primary winding. Once the gap fires, the electrical behavior of either circuit is identical. Experiments have shown that neither circuit offers any marked performance advantage over the other. However, in the typical circuit (above), the spark gap's short circuiting action prevents high frequency oscillations from 'backing up' into the supply transformer. In the alternate circuit, high amplitude high frequency oscillations that appear across the capacitor also are applied to the supply transformer's winding. This can induce corona discharges between turns that weaken and eventually destroy the transformer's insulation. Experienced Tesla coil builders almost exclusively use the top circuit, often augmenting it with low pass filters (resistor and capacitor (RC) networks) between the supply transformer and spark gap to help protect the supply transformer. This is especially important when using transformers with fragile high voltage windings, such as Neon-sign transformers (NSTs). Regardless of which configuration is used, the HV transformer must be of a type that self-limits its secondary current by means of internal leakage inductance. A normal (low leakage inductance) high voltage transformer must use an external limiter (sometimes called a ballast) to limit current. NSTs are designed to have high leakage inductance to limit their short circuit current to a safe level. The primary coil's resonant frequency should be tuned to that of the secondary, using low-power oscillations, then increasing the power until the apparatus has been brought under control. While tuning, a small projection (called a "breakout bump") is often added to the top terminal in order to stimulate corona and spark discharges (sometimes called streamers) into the surrounding air. Tuning can then be adjusted so as to achieve the longest streamers at a given power level, corresponding to a frequency match between the primary and secondary coil. Capacitive 'loading' by the streamers tends to lower the resonant frequency of a Tesla coil operating under full power. For a variety of technical reasons, toroids provide one of the most effective shapes for the top terminals of Tesla coils. While generating discharges, electrical energy from the secondary and toroid is transferred to the surrounding air as electrical charge, heat, light, and sound. The electric currents that flow through these discharges are actually due to the rapid shifting of quantities of charge from one place (the top terminal) to other places (nearby regions of air). The process is similar to charging or discharging a capacitor. The current that arises from shifting charges within a capacitor is called a displacement current. Tesla coil discharges are formed as a result of displacement currents as pulses of electrical charge are rapidly transferred between the high voltage toroid and nearby regions within the air (called space charge regions). Although the space charge regions around the toroid are invisible, they play a profound role in the appearance and location of Tesla coil discharges. 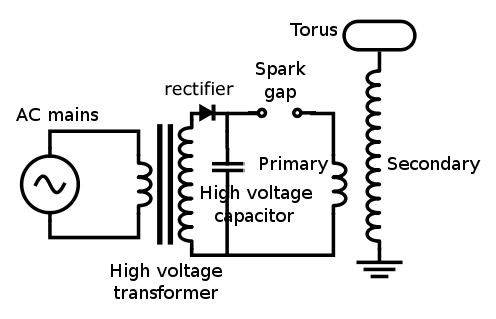 When the spark gap fires, the charged capacitor discharges into the primary winding, causing the primary circuit to oscillate. The oscillating primary current creates a magnetic field that couples to the secondary winding, transferring energy into the secondary side of the transformer and causing it to oscillate with the toroid capacitance. The energy transfer occurs over a number of cycles, and most of the energy that was originally in the primary side is transferred into the secondary side. The greater the magnetic coupling between windings, the shorter the time required to complete the energy transfer. As energy builds within the oscillating secondary circuit, the amplitude of the toroid's RF voltage rapidly increases, and the air surrounding the toroid begins to undergo dielectric breakdown, forming a corona discharge. As the secondary coil's energy (and output voltage) continue to increase, larger pulses of displacement current further ionize and heat the air at the point of initial breakdown. This forms a very conductive "root" of hotter plasma, called a leader, that projects outward from the toroid. The plasma within the leader is considerably hotter than a corona discharge, and is considerably more conductive. In fact, it has properties that are similar to an electric arc. The leader tapers and branches into thousands of thinner, cooler, hairlike discharges (called streamers). The streamers look like a bluish 'haze' at the ends of the more luminous leaders, and it is the streamers that actually transfer charge between the leaders and toroid to nearby space charge regions. The displacement currents from countless streamers all feed into the leader, helping to keep it hot and electrically conductive. The primary break rate of sparking Tesla coils is slow compared to the resonant frequency of the resonator-topload assembly. When the switch closes, energy is transferred from the primary LC circuit to the resonator where the voltage rings up over a short period of time up culminating in the electrical discharge. In a spark gap Tesla coil the primary-to-secondary energy transfer process happens repetitively at typical pulsing rates of 50–500 times per second, and previously formed leader channels don't get a chance to fully cool down between pulses. So, on successive pulses, newer discharges can build upon the hot pathways left by their predecessors. This causes incremental growth of the leader from one pulse to the next, lengthening the entire discharge on each successive pulse. Repetitive pulsing causes the discharges to grow until the average energy that's available from the Tesla coil during each pulse balances the average energy being lost in the discharges (mostly as heat). At this point, dynamic equilibrium is reached, and the discharges have reached their maximum length for the Tesla coil's output power level. The unique combination of a rising high voltage Radio Frequency envelope and repetitive pulsing seem to be ideally suited to creating long, branching discharges that are considerably longer than would be otherwise expected by output voltage considerations alone. High voltage discharges create filamentary multi-branched discharges which are purplish blue in colour. High energy discharges create thicker discharges with fewer branches, are pale and luminous, almost white, and are much longer than low energy discharges, because of increased ionisation. There will be a strong smell of ozone and nitrogen oxides in the area. The important factors for maximum discharge length appear to be voltage, energy, and still air of low to moderate humidity. However, even more than 100 years later after the first use of Tesla coils, there are many aspects of Tesla coil discharges and the energy transfer process that are still not completely understood. The Tesla coil can also be used for wireless transmission. In addition to the positioning of the elevated terminal well above the top turn of the helical resonator, another difference from the sparking Tesla coil is the primary break rate. The optimized Tesla coil transmitter is a continuous wave oscillator with a break rate equaling the operating frequency. The combination of a helical resonator with an elevated terminal is also used for wireless reception. The Tesla coil receiver is intended for receiving the non-radiating electromagnetic field energy produced by the Tesla coil transmitter. The Tesla coil receiver is also adaptable for exploiting the ubiquitous vertical voltage gradient in the Earth's atmosphere. Tesla built and used various devices for detecting electromagnetic field energy. His early wireless apparatus operated on the basis of Hertzian waves or ordinary radio waves, electromagnetic waves that propagate in space without involvement of a conducting guiding surface. During his work at Colorado Springs, Tesla believed he had established electrical resonance of the entire Earth using the Tesla coil transmitter at his "Experimental Station." Tesla stated one of the requirements of the World Wireless System was the construction of resonant receivers. The related concepts and methods are part of his wireless transmission system (US1119732 — Apparatus for Transmitting Electrical Energy — 1902 January 18). Tesla made a proposal that there needed to be many more than thirty transmission-reception stations worldwide. In one form of receiving circuit the two input terminals are connected each to a mechanical pulse-width modulation device adapted to reverse polarity at predetermined intervals of time and charge a capacitor. This form of Tesla system receiver has means for commutating the current impulses in the charging circuit so as to render them suitable for charging the storage device, a device for closing the receiving-circuit, and means for causing the receiver to be operated by the energy accumulated. Tesla coil in one experiment of many conducted in Colorado Springs. This is a grounded tuned coil in resonance with a nearby transmitter; Light is glowing near the bottom. A Tesla coil used as a receiver is referred to as a Tesla receiving transformer. The Tesla coil receiver acts as a step-down transformer with high current output. The parameters of a Tesla coil transmitter are identically applicable to it being a receiver (e.g.., an antenna circuit), due to reciprocity. Impedance, generally though, is not applied in an obvious way; for electrical impedance, the impedance at the load (e.g.., where the power is consumed) is most critical and, for a Tesla coil receiver, this is at the point of utilization (such as at an induction motor) rather than at the receiving node. Complex impedance of an antenna is related to the electrical length of the antenna at the wavelength in use. Commonly, impedance is adjusted at the load with a tuner or a matching networks composed of inductors and capacitors. A Tesla coil can receive electromagnetic impulses from atmospheric electricity and radiant energy, besides normal wireless transmissions. Radiant energy throws off with great velocity minute particles which are strongly electrified and other rays falling on the insulated-conductor connected to a condenser (i.e., a capacitor) can cause the condenser to indefinitely charge electrically. The helical resonator can be "shock excited" due to radiant energy disturbances not only at the fundamental wave at one-quarter wave-length but also is excited at its harmonics. Hertzian methods can be used to excite the Tesla coil receiver with limitations that result in great disadvantages for utilization, though. The methods of ground conduction and the various induction methods can also be used to excite the Tesla coil receiver, but are again at a disadvantages for utilization. The charging-circuit can be adapted to be energized by the action of various other disturbances and effects at a distance. Arbitrary and intermittent oscillations that are propagated via conduction to the receiving resonator will charge the receiver's capacitor and utilize the potential energy to greater effect. Various radiations can be used to charge and discharge conductors, with the radiations considered electromagnetic vibrations of various wavelengths and ionizing potential. The Tesla receiver utilizes the effects or disturbances to charge a storage device with energy from an external source (natural or man-made) and controls the charging of said device by the actions of the effects or disturbances (during succeeding intervals of time determined by means of such effects and disturbances corresponding in succession and duration of the effects and disturbances). The stored energy can also be used to operate the receiving device. The accumulated energy can, for example, operate a transformer by discharging through a primary circuit at predetermined times which, from the secondary currents, operate the receiving device. Tesla stated that the output power from these devices, attained from Hertzian methods of charging, was low, but alternative charging means are available. Tesla receivers, operated correctly, act as a step-down transformer with high current output. There are, to date, no commercial power generation entities or businesses that have utilized this technology to full effect. The power levels achieved by Tesla coil receivers have, thus far, been a fraction of the output power of the transmitters. The dangers of contact with high frequency electrical current are sometimes perceived as being less than at lower frequencies, because the subject usually doesn't feel pain or a 'shock'. This is often erroneously attributed to skin effect, a phenomenon that tends to inhibit alternating current from flowing inside conducting media. It was thought that in the body, Tesla currents travelled close to the skin surface, making them safer than lower frequency electric currents. In fact, in the early 1900s a major use of Tesla coils was to apply high frequency current directly to the body in electrotherapy. Although skin effect limits Tesla currents to the outer fraction of an inch in metal conductors, the 'skin depth' of human flesh at typical Tesla coil frequencies is still of the order of 60 inches (150 cm) or more. This means that high frequency currents will still preferentially flow through deeper, better conducting, portions of an experimenter's body such as the circulatory and nervous systems. The reason for the lack of pain is that a human being's nervous system does not sense the flow of potentially dangerous electrical currents above 15–20 kHz; essentially, in order for nerves to be activated, a significant number of ions must cross their membrane before the current (and hence voltage) reverses. Since the body no longer provides a warning 'shock', novices may touch the output streamers of small Tesla coils without feeling painful shocks. However, there is anecdotal evidence among Tesla coil experimenters that temporary tissue damage may still occur and be observed as muscle pain, joint pain, or tingling for hours or even days afterwards. This is believed to be caused by the damaging effects of internal current flow, and is especially common with continuous wave (CW), solid state or vacuum tube type Tesla coils. It is, however, of note that certain transformers can be used to provide alternating current with a frequency high enough so that the skin depth becomes small enough for the voltage to be safe. As this number is inversely proportional to the root of the frequency, this is fairly high; the number is in the megahertz. Large Tesla coils and magnifiers can deliver dangerous levels of high frequency current, and they can also develop significantly higher voltages (often 250,000–500,000 volts, or more). Because of the higher voltages, large systems can deliver higher energy, potentially lethal, repetitive high voltage capacitor discharges from their top terminals. Doubling the output voltage quadruples the electrostatic energy stored in a given top terminal capacitance. If an unwary experimenter accidentally places himself in path of the high voltage capacitor discharge to ground, the low current electric shock can cause involuntary spasms of major muscle groups and may induce life-threatening ventricular fibrillation and cardiac arrest. Even lower power vacuum tube or solid state Tesla coils can deliver RF currents that are capable of causing temporary internal tissue, nerve, or joint damage through Joule heating. In addition, an RF arc can carbonize flesh, causing a painful and dangerous bone-deep RF burn that may take months to heal. Because of these risks, knowledgeable experimenters avoid contact with streamers from all but the smallest systems. Professionals usually use other means of protection such as a Faraday cage or a chain mail suit to prevent dangerous currents from entering their body. The most serious dangers associated with Tesla coil operation are associated with the primary circuit. It is the primary circuit that is capable of delivering a sufficient current at a significant voltage to stop the heart of a careless experimenter. Because these components are not the source of the trademark visual or auditory coil effects, they may easily be overlooked as the chief source of hazard. Should a high frequency arc strike the exposed primary coil while, at the same time, another arc has also been allowed to strike to a person, the ionized gas of the two arcs forms a circuit that may conduct lethal, low-frequency current from the primary into the person. Further, great care should be taken when working on the primary section of a coil even when it has been disconnected from its power source for some time. The tank capacitors can remain charged for days with enough energy to deliver a fatal shock. Proper designs should always include 'bleeder resistors' to bleed off stored charge from the capacitors. In addition, a safety shorting operation should be performed on each capacitor before any internal work is performed. Tesla's Colorado Springs laboratory possessed one of the largest Tesla coils ever built, known as the "Magnifying Transmitter". The Magnifying Transmitter is somewhat different from classic 2-coil Tesla coils. A Magnifier uses a 2-coil 'driver' to excite the base of a third coil ('resonator') that is located some distance from the driver. The operating principles of both systems are similar. The world's largest currently existing 2-coil Tesla coil is a 130,000-watt unit, part of a 38-foot-tall (12 m) sculpture. It is owned by Alan Gibbs and currently resides in a private sculpture park at Kakanui Point near Auckland, New Zealand. The Tesla coil is an early predecessor (along with the induction coil) of a more modern device called a flyback transformer, which provides the voltage needed to power the cathode ray tube used in some televisions and computer monitors. The disruptive discharge coil remains in common use as the ignition coil or spark coil in the ignition system of an internal combustion engine. These two devices do not use resonance to accumulate energy, however, which is the distinguishing feature of a Tesla coil. They do use inductive "kick", the forced, abrupt decay of the magnetic field, such that a voltage is provided by the coil at its primary terminals that is much greater than the voltage that was applied to establish the magnetic field, and it is this higher voltage that is then multiplied by the transformer turns ratio. Thus, they do store energy, and a Tesla resonator stores energy. A modern, low power variant of the Tesla coil is also used to power plasma globe sculptures and similar devices. Scientists working with a glass vacuum line (e.g. chemists working with volatile substances in the gas phase, inside a system of glass tubes, taps and bulbs) test for the presence of tiny pin-holes in the apparatus (especially a newly blown piece of glassware) using a Tesla coil. When the system is evacuated and the discharging end of the coil moved over the glass, the discharge travels through any pin-hole immediately below it and thus illuminates the hole, indicating points that need to be annealed or re-blown before they can be used in an experiment.